It is with heavy hearts that we announce the peaceful passing of our beloved Father, Grandfather and Great Grandfather on Tuesday, April 2, 2019 at the age of 91 years old. Rafal was born on October 7, 1927 in Lodz, Poland. Rafal was predeceased by his wife Joyce. Rafal is survived by his children Edmund, Debi and Steve, grandchildren Melissa, Sasheen (Josh), Kolton (Alyssia) and Christopher, great grandchildren Phoenix, Marley, and Hailey Wares, Maya and Sophie Simpson and Ceejay Gus. Dad lived with his family in Lodz, Poland until the age of 12 whereupon he went to live with his eldest sister in White Russia. The war erupted in Europe and he was taken from his family by the German Army at the age of 12. He was sent to a Forced Labour Camp in Germany and imprisoned until the age of 17, when he managed to escape. He then joined the Allies and made it to freedom! Rafal met our mother in 1950 while working as a miner in San Antonio Gold Mines in Bissett, Mb. They soon married and together they raised their children in Bissett and Lac du Bonnet, MB. Rafal and Joyce were married for 53 years before his beloved wife was taken suddenly from him 15 years ago. Rafal was a man of tremendous skills and talent. While he never had a chance to attain the education we all aspire to, he was able to instinctively know and understand how things worked and how to repair just about anything. He built his and Joyce’s first home by hand and worked in many different occupations during his working life, always striving to do the very best he could and never compromising his principles. He always taught his children that no matter what type of job you had, you always had to work hard for what you were being paid to do. Living in Bissett, he was an avid hunter and fisherman. 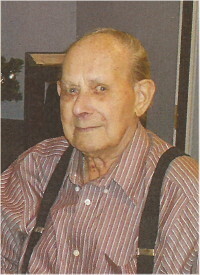 Due to severe arthritis in his back, he gave that up and became more involved with travelling around the province with his wife Joyce, who was actively involved with the Manitoba Metis Federation. Rafal was a fun-loving man, always had a witty response and snappy comebacks to peoples remarks. He loved his family dearly and there are no words to adequately express how much he’ll be missed by us all. A memorial service celebrating his life will be held on Wednesday, April 10 at 11:00 a.m. at Notre Dame du Lac Roman Catholic Church in Lac du Bonnet, MB with viewing one hour prior to the service. A luncheon will follow in the Church Basement. I met Raul through dear friend Joyce. He surely had a sense of humor. May his spirit be now joined with Joyce. Steve – Rick and I are devastated to hear of your loss. We never met your Dad, but it sounds like he was an amazing person. Sending you our love.